great Bordeaux who drink it. What’s more, it also has the blue-blooded tenaciousness to remain this jaw-droppingly impressive, throughout its many guises over time, and for a very, very long time. The 2014 Haut Brion is a blend of 50% Merlot, 11% Cabernet Franc and 39% Cabernet Sauvignon picked between 11 September and 10 October, cropped at 42.9 hectoliters per hectare and raised in 70% new oak. As I observed when I made the comparison in barrel, the Haut Brion exudes more red fruit than La Mission Haut Brion, adorned with wild strawberry, bilberry, tobacco and again, just that hint of menthol in the background. The palate is very fresh and taut on the entry. The acidity is very nicely pitched and there is a touch of marmalade and blood orange that is tangible at the back of the mouth. There is real frisson to this Haut Brion, not quite as seductive and as smooth as its sibling over the road, but very persistent in the mouth. I noticed that over 15 to 20 minutes that the Haut Brion just gained more and more complexity, putting a small distance between itself and La Mission, as if determined to mock my opinion in barrel that La Mission would have the upper hand! Be my guest. Haut Brion has an inch, just an inch ahead of its "rival" sibling. As for the 2010 Haut-Brion, it does not have the power of Latour’s 2010 or the intense lead pencil shavings and chocolaty component of Lafite-Rothschild, but it is extraordinary, perfect wine. It has a slightly lower pH than the 2009 (3.7 versus the 2009's 3.8), and even higher alcohol than the 2009 (14.6%). The wine is ethereal. From its dense purple color to its incredibly subtle but striking aromatics that build incrementally, offering up a spectacular smorgasbord of aromas ranging from charcoal and camphor to black currant and blueberry liqueur and spring flowers, this wine’s finesse, elegant yet noble power and authority come through in a compelling fashion. It is full-bodied, but that’s only apparent in the aftertaste, as the wine seems to float across the palate with remarkable sweetness, harmony, and the integration of all its component parts ? alcohol, tannin, acidity, wood, etc. This prodigious Haut-Brion is hard to compare to another vintage, at least right now, but it should have 50 to 75 years of aging potential. Anticipated maturity: 2022-2065+. It has been a few years since I last tasted the 2004 Haut-Brion. Now at 12 years of age, it retains its deep color. The bouquet is "pleasant" if not as complex as the 2004 Latour, yet it's possibly just biding its time as it gradually opens with black fruit, black olive, even a touch of mint that might dupe you into thinking Pauillac. The palate is medium-bodied and very harmonious, almost caressing thanks to the Merlot lending that velvety texture. The second half changes tack, the Cabernet nudging the Merlot off the stage and delivering a more structured, possibly foursquare finish that is linear and correct. It is an excellent wine for the vintage although it will always be overshadowed by the 2005 inter alia. Maybe more personality just needs to develop? Tasted September 2016. The dark plum/purple-tinged 2002 has completely closed down since bottling. It reveals a restrained but promising bouquet of licorice, truffles, black fruits, and sweet new wood. With medium body, fine richness, and moderate tannin, it requires 1-3 years of bottle age. Anticipated maturity: 2007-2016. The Chateau Haut-Brion 1975 has been variable in the past, however this is one of the better examples with deep garnet color. The nose is lively with leather and scorched earth scents infusing the dusky black fruit, later a faint touch of terracotta coming through. The palate is well balanced, quite animally and feral for a respectable First Growth, but that is exactly what lends it its charm. There is just some dryness creeping in on the finish, so I would drink bottles over the next ten years or so. Perhaps given the quality of its sister La Mission Haut-Brion in this year, you would expect more, but it remains a delightful, self-effacing Haut-Brion that is best consumed sooner rather than later. Tasted July 2014. 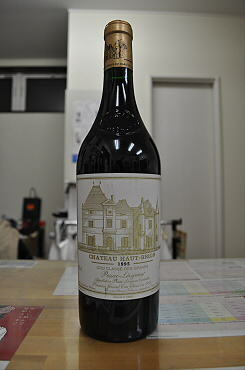 For me, the 1971 is the best Haut-Brion produced between 1966 and 1975. This fully mature 1971 has a sumptuous, sweet, ripe, earthy, richly fruity flavor, medium to full body, a big, full-intensity, spicy bouquet, and a silky, supple texture. This very stylish and delicious wine should be drunk up. Not retasted since 1982, but I suspect this wine should still be in fine condition. Anticipated maturity: Now. Last tasted, 4/82. Although surprisingly light-bodied, consistently pleasant and enjoyable, this is an undistinguished effort. The 1970 Haut-Brion has always come across as angular, and lacking the exceptional perfume and complexity this estate can achieve. In this tasting, the wine displayed vegetal, tobacco scents, good spice, some fruit, and a medium ruby color with significant amber. The tannin and acidity were too high for the amount of fruit, glycerin, and extract. Drink it up.